The City of Orange was incorporated in 1871. It was the only city in Orange County to be planned and built around a plaza. It earned it the nickname Plaza City. The city is one of the most searched locations in OC for vintage and historic homes. This is because the city has done an outstanding job of preserving their historic district and neighborhoods. Real estate in the city includes an abundance of affordable condos, town homes, and single family ranch homes. There are also a good number of Income properties (duplexes, triplexes, etc) for sale. Neighboring Orange Park Acres is an unincorporated community and is one of the County's premier equestrian communities. It was founded in 1928 as the official equestrian destination of OC. The community prides itself on that today. Much of that historical heritage has been preserved with the lack of sidewalks and street lights, and the abundance of horse trails. If you are searching for horse properties in OC, I always suggest starting in OPA. There are many beautiful equestrian estate properties for sale, but also many relatively affordable horse properties. Homes with Panoramic views! . Homes with no Mello Roos . Horse properties in OPA . Income properties (duplexes, triplexes, fourplexes) . Lots and land for sale . For your convenience, the following home search is by price range in $100,000 increments. $ 800,000 to $ 1M . Are you interested in selling your home or property? If you are interested in selling your home or property in Orange or anywhere else in OC, Call me! My team is very experienced in all areas of residential sales and real estate. This includes single family homes, condos, horse properties, multi-unit properties, and lots and land. We will be happy to provide you with a complimentary Comparative Market Analysis so that you can find out how much your property is worth in today's market. Read how we can help you sell your home, here. If you are upside-down on your home or if you are experiencing financial difficulties, we will be happy to assist you with a short sale . A short sale may help you save your credit and prevent lender collections in many cases. Please feel free to call me if you would like to discuss! 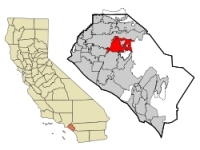 Children in this city attend schools in the Orange Unified School District. It includes a number of Elementary, Middle, and High Schools, as well as special schools and programs. To see a list of school ratings, visit the Great Schools web site here. Top rated schools include Chapman Hills Elementary, McPherson Magnet School, El Modena High School, Linda Vista Elementary, and Santiago Middle School. The city is also the home of Chapman University, which is the largest private university in the county. I will be happy to help you with a purchase, sale, or lease of a home in Orange, OPA, or anywhere else in Orange County, CA. I specialize in sales, leases, and real estate throughout OC. If you are in the market for a condominium, town home, single family home, luxury property, investment property, income property, vintage home, beach cottage, equestrian estate, a short sale, or a lot, land, or acreage, please contact me.